Mandizha strikes gold at Northeast Open! FM Farai Mandizha has made good since arriving in the US some months ago. He upset GM Hikaru Nakamura at Foxwoods, earned an IM norm at the World Open and now has won the Northeastern Open. The young master from Zimbabwe beat GM Alexander Ivanov in a 4th round encounter and held GM Sergey Kudrin to win the top prize. Zimbabwe has had an number of players who have fared well in international competition, but Mandizha is the latest and perhaps the brightest to have played in the U.S. Compatriot Robert Gwaze is in Singapore helping to train the next generation of players and Kudzanai Mamombe is based in India. Mandizha has also picked up students since arriving in New York. Mandizha will most likely play in the U.S. Open and hopes that his fortunes will continue in the U.S. He has already beaten several Grandmasters and hopes to earn additional norms in the near future. 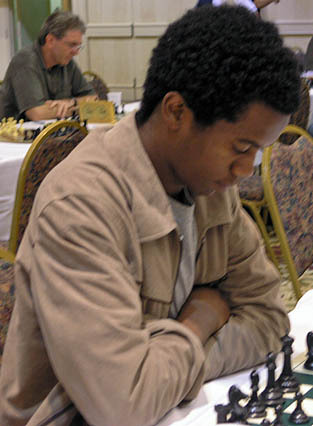 FM Farai Mandizha scored an undefeated 4½-½.